It�s play time and learning time all in one! Let children exercise their minds, imaginations, and bodies with play furniture for preschools. If it�s a rainy day, or you just want to keep your class indoors, look into soft balance beams or wooden balance beams for children to learn Balance and play out gymnast dreams. Simply lay them out over Activity Rugs. If they need to Climb and Slide, try offering the class a child loft, an indoor slide, soft climbers, and toddler tunnels. The children will have a great time climbing, hiding, and honing their motor skills. Let children expand their imaginations with Dramatic Play. 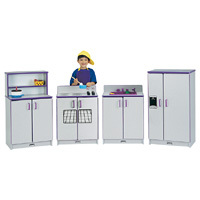 Your classroom will feel more complete with a kitchen set for children, preschool castles, dress up centers for children, and all of the doll accessories necessary to make a child feel like their doll is their baby. If you need more specific play sets, there are toy woodwork sets, toy laundry sets, preschool puppet show sets, rocking boats for toddlers, and a space playset to choose from! Blocks allow for fine motor and building skills. Keep children focused on building block sets and keep the blocks neatly in building block storage when not in use to keep your room neat! When it�s time to go outside for Riding Activities and outdoor play with the class, offer toddler tricycles and keep the toddler helmets on to prevent injury! Allow children to set up toy traffic signs to maneuver around. If you�re going on a Walk, keep children close by on a walking rope with handles, or keep them safe in a buggy for children or a group stroller. You�ll never be bored with all of these playset options for preschools and daycares! Have the best classroom playsets in the school and allow children to have fun and expand their minds!